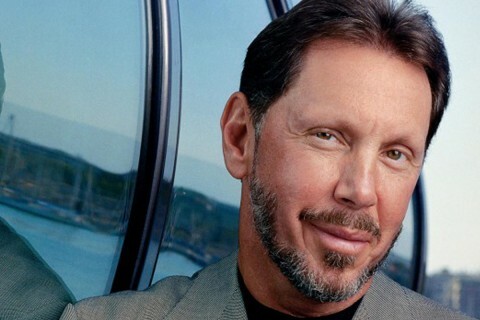 Larry Ellison, the founder of Oracle Corp., grew up thinking he would move to Los Angeles, attend USC, get married and become a doctor. 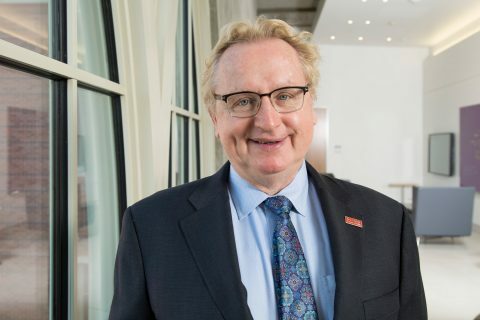 Many people he grew up with on the south side of Chicago expected him to do just that, he told the thousands attending USC’s 133rd commencement today on the University Park Campus. Ellison attended college and took courses in pre-medicine. But he dropped out at age 21. “Virtually everyone important in my life — my family, my teachers, my girlfriend — wanted me to be a doctor,” said Ellison, who this week announced a $200 million gift for USC to establish a cancer research center, the Lawrence J. Ellison Institute for Transformative Medicine of USC. He packed up his belongings and moved to Berkeley. Soon after, he began to work in computer programming. He embraced the outdoors. Ellison married, but his wife began to ask him to take classes and perhaps get a degree. Ellison took some classes, but the most enjoyable one, he found, was a sailing course. His wife kicked him out and accused him of lacking ambition — not knowing that later he would become an accomplished leader in Silicon Valley and an expert sailor, bringing back the America’s Cup in 2010 and 2013 with Oracle Team USA. Ellison said divorce marked a pivotal moment. Nearly 17,000 degrees were given today to a diverse group of USC graduates, representing all 50 states and 112 nations. Commencement drew an estimated 60,000 people to support their loved ones in celebration of their achievements. 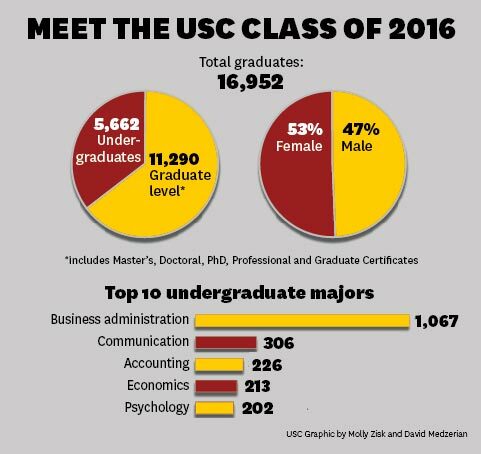 USC President C. L. Max Nikias praised the graduates gathered in Alumni Park, noting that they are forever members of the Trojan Family. 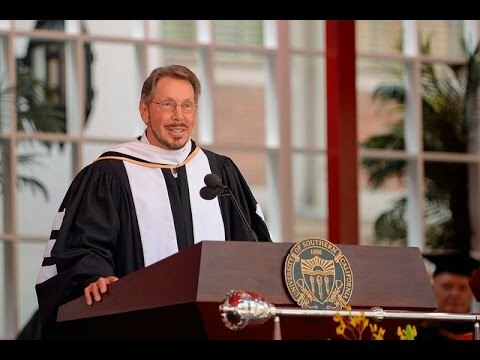 Speaking to the graduates, Ellison offered advice he learned from his close friend, Steve Jobs. The late Apple CEO and president of was friends with Ellison for 30 years. Jobs died of cancer in 2011 at the pinnacle of success, but he had experienced extreme lows, too, Ellison recalled. At one point during Jobs’ absence from Apple, Ellison met with Jobs to walk together at Castle Rock State Park in the Santa Cruz Mountains and offered to help him by buying the company and appointing him CEO. Jobs declined and offered another plan that would involve putting him on Apple’s board. Ellison questioned whether Jobs’ plan would be profitable. “Yeah, I know, I know, but we don’t have to keep it, we could give it all away,” Ellison responded. Jobs said: “I’m not doing this for money. I don’t want to get paid. If I do this, I need to do this standing on the moral high ground,” Ellison recalled. Ellison joined the Apple board of directors and then Jobs became a board member. “And then I watched Steve build the most valuable company on Earth,” he said. Ellison told the newly minted graduates that he learned through Jobs and his own life that “passion and love are different,” he said. “Deep inside of all of us — all of us — there is a primal desire to do something important with our lives,” he said. Ellison was one of six people presented with honorary degrees. The others were Academy Award-winning Mexican filmmaker Alejandro G. Iñárritu, known most recently for the film The Revenant; Jackie Lacey, the first African-American and woman to be elected and sworn in as Los Angeles County District Attorney; Mark Stevens, a USC trustee and managing partner of his family investment firm, S-Cubed Capital; Mary Stevens, a co-chair of the Sacred Heart Prep (Atherton) Spring Auction and member of the Alzheimer’s Association’s Part the Cloud Committee; and Selim Zilkha, the co-owner of Zilkha Biomass Energy whose legacy is the Zilkha Neurogenetic Institute at the Keck School of Medicine at USC. Nikias recognized valedictorian Sulekha Ramayya for her achievements. Ramayya, a USC Renaissance and Presidential scholar, is a biomedical engineering major who also earned a minor in business finance. Nikkias noted that Ramayya has distinguished herself as an ambitious, compassionate social entrepreneur. Nikkias also recognized the Class of 2016’s two salutatorians. Ryan Lindveit received a bachelor of music composition degree from the USC Thornton School of Music. Literature is the backbone of much of his musical work. He recently won the USC New Music for Orchestra Competition with “Like an Altar With Nine Thousand Robot Attendants,” a piece inspired by the late science fantasy author Ray Bradbury. “Today, we honor his stellar artistic talents, as well as his academic excellence,” Nikias said. 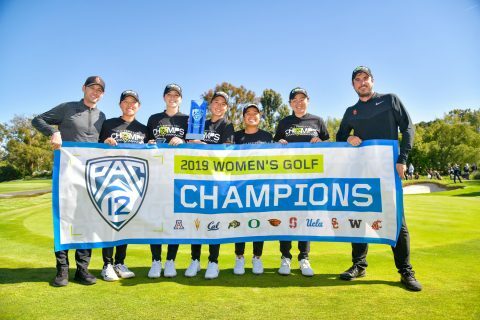 Adrienne Visani was recognized for her research at the USC Zilkha Neurogenetic Institute, as well as for her volunteer work at a medical clinic in South Africa. 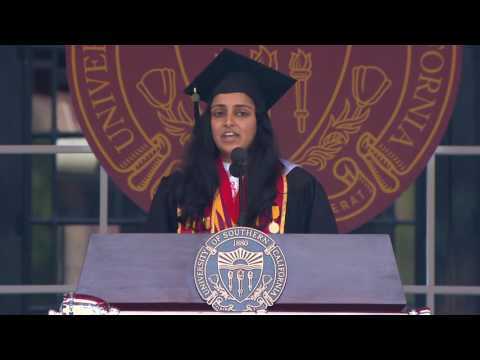 A USC Trustee Scholar, Visani earned a degree in neuroscience at the USC Dornsife College of Letters, Arts and Sciences. 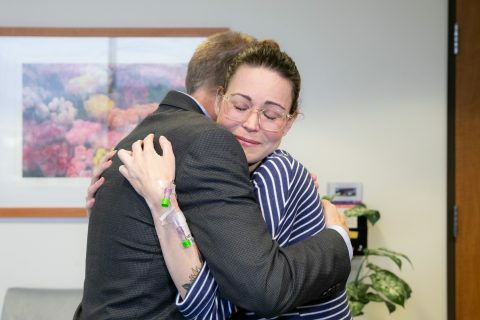 “Today we salute Adrienne’s brilliant scholarship and dedication to her medical training,” Nikias said. Among the students who received special recognition was 96-year-old Alfonso Gonzales, who recently discovered he was one unit short of his degree. A discussion with a member of the Office of the Registrar led the USC Davis School of Gerontology to create an independent study for Gonzales, a World War II Air Force veteran, to complete his degree. Nikias praised Gonzales for his tenacity. “Like a true Trojan, he was determined to ‘Fight On,’ and finish what he began,” Nikias said, as the crowd cheered. During her speech, Ramayya offered three things for graduates to keep in mind as they start their careers or other endeavors: time, humility and mentors. The 2016 graduates will move on to make their mark. Upon reflecting on his own life, Ellison said they are starting their own great adventures. The tech entrepreneur and main speaker shares advice: Follow your dreams, not the dreams of others. 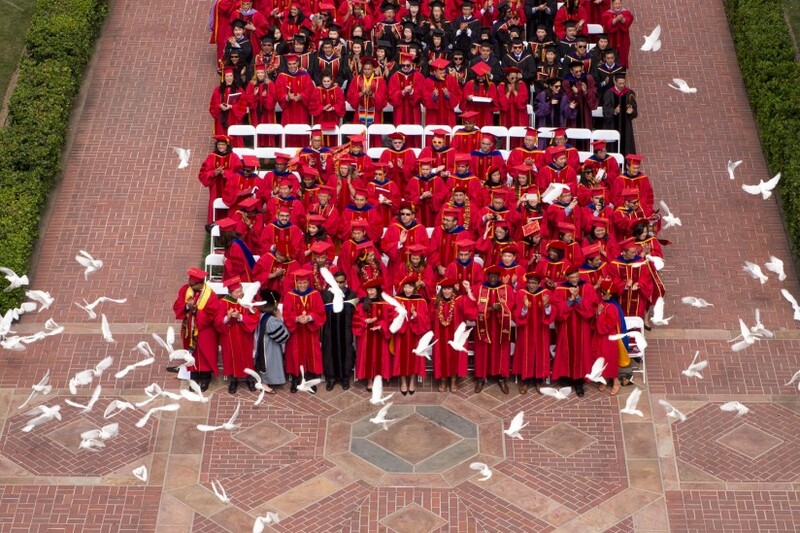 The valedictorian’s commencement address reflects on her time at USC, looks to the future — and provides a few laughs along the way.